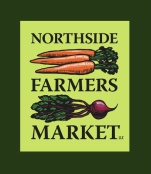 The Northside Farmers Market has been in existence since 2002. It began as a couple of vendors selling out of the back of their trucks in a parking lot and has become a year-round farmers market that has been ranked 3rd Best Farmers Market by CityBeat. All of our products are produced within 70 miles of Northside. We have ~20 vendors selling everything from produce, fruit, bread, cheese, pastries, jams, meats, ferments, soaps, baked goods, spices, chocolates, coffees, and much more. We currently have two part-time staffers: Emily, Manager, and Harry, Assistant Manager.